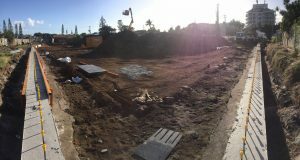 RDG Construction Pty Ltd were appointed to construct The Hedge at Buddina. On this highly sought after location close to the beach, surf club, shops, university and healthcare ASP Piling installed a secant pile wall. The development planned for commercial use on the lower level with wine bars, cafes, restaurants and specialty stores. The residential apartments are in one, two and three bedroom configurations on the five levels above. This includes 92 apartments and five additional penthouses. Construction is expected to be completed mid 2019. ASP Piling was engaged to retain the site where basement excavations will extend from 2.9 and 3.3 metres below ground level, with additional lift pits internally. 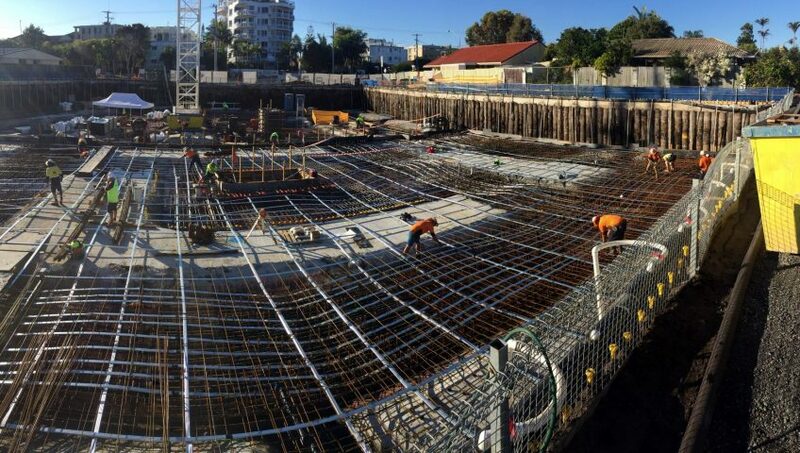 A single level basement car park was being constructed underneath the two six storey residential apartment buildings. 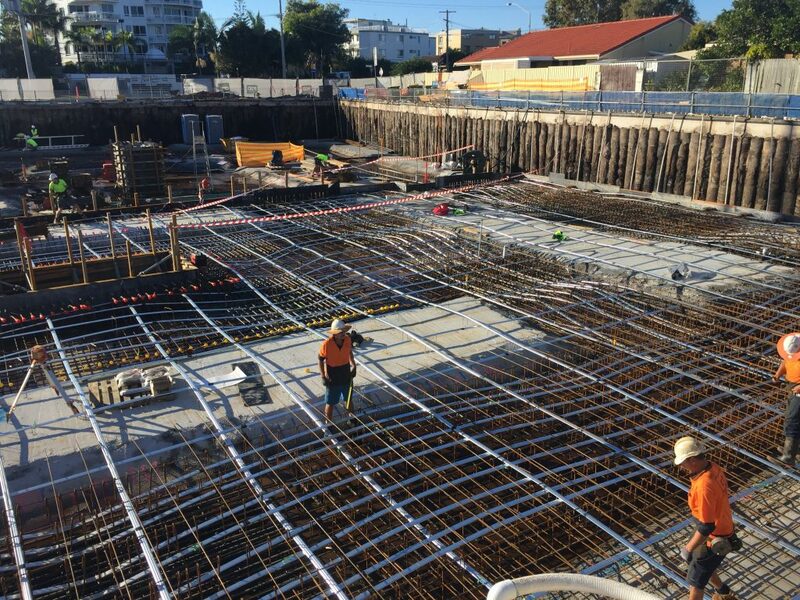 The Bauer RTG piling rig was used, along with the Kubota excavator, a Franna crane, EWP, compressors and concrete pumps to install approximately 235 lineal metres of secant piling for the basement retention walls. The secant option was used as the neighbouring buildings were close to the property boundary and to allow the excavation depth of approximately 3 metres varying according to site and design requirements. An internal spear dewatering system was installed throughout the basement construction process as groundwater inflow levels had previously been detected from a depth of just over 1 metre. A groundwater pH buffering treatment system, sedimentation tank and a pioneer heavy metals reduction unit were used onsite to balance the pH, reduce the turbidity and high presence of iron in the water prior to discharge from the site. All tanks were operational prior to the commencement of dewatering from the site to ensure the measured discharge is meets or exceeds the required water quality standards. For the dewatering management on “The Hedge”, the initial dewatering discharge is directed back within the site to allow the initial clarification of the extracted groundwater. The samples of treated groundwater were analysed to ensure measured parameters are met before discharging from site. As is standard practice, a Dewatering Management Plan was put in place prior to commencement of dewatering for environmental and quality control.